My text chimes. My email chimes. My cell phone rings. As I read the text on the way to answering the cell, our land line begins to ring. I know. It’s The Barn Emergency Alert System. Bella texted: Jim says Leo says Hudson is colicking. Jim says in my ear: Leo says Hudson is colicking. Jim’s expertise is in How to Fix Things Horses Continuously Break. Which is why he’s reporting what Leo said, and calls Bella first. He’s not sure whose horse Leo is worried about. God bless ALL these people. I’m 15 minutes out if I pull sweats over my pj’s, and break the speed limit. For those not familiar with horse digestive systems: these big strong animals have the digestive sensitivity of a cranky octogenarian. Change the pudding flavor, and cranky Octo could be bedridden for days, hammering her cane on the railing. Change her Jeopardy channel, and she could go into shock, burst a gut, and die. Horses are that terrifyingly fragile. While I try to focus on stopping at stop signs. Siri reads Bella’s email to me: H colicking. Can use Mo. Mo is Hudson’s roommate, and Bella’s back up rope horse. You would LOVE him. He’s a Humvee-slash-Monster Truck in a world of sports cars. He’s so wide and bulked up, he looks like he’s been abusing steroids for years. (He hasn’t.) Despite his massive width and body-builder muscling, he has the heart of Ferdinand the Bull. Mo would very much like to find a tree to sit beneath, and smell a flower. I tack up Mo, pry a bright and non-colicky looking Hudson away from banging on his feeder (Hellooooo…hungry…), and we pony. If I hadn’t listened to his gut sounds, I’d think he was fine: freight train moving through his bowels on his right side. Acute and terrifying silence on the left. Mo worries. Hudson calculates if he can get grass out of this. Hudson is nonchalantly relaxed while walking. A mild gas colic? No sign of pain. Twenty minutes in, he stops, lifts his tail, and produces one phenomenally long and sonically impressive Super Fart. He poops regally, a gloriously giant deposit. Hudson is cured! Ha. Take THAT, Forces of Evil. I do the normal thing and take a poop photo, and text it to Bella: THANK YOUUUUUUU. It’s gratifying to know Forces of Evil can be thwarted by farting. On Hudson’s 26th birthday. I make sure he’s thoroughly warmed up before I turn him out for play time in the arena with The Monster Truck. I’m ridiculously proud of how good he looks and how young he acts. Ridiculous, because I have nothing to do with how good he looks. Good genetics, a sense of entitlement, and a stubborn attitude apparently help one age well. A lot can change in 7 seconds. Immediately after the video above, Hudson rocks back on his haunches, drops low, and rips flat-out into a dead gallop. He’s doing a speed drill. This is all wrong. My heart is pounding in my throat. There are claws in my stomach. He hasn’t done a speed drill in a loooong time. Gravity hurls itself across the arena at the last second, and Hudson trips. It devolves into the kind of crash about which horse people have nightmares. Hudson falls hard on both bad knees, his neck twists and whumps, the pipe fence is ringing bell-like from (I’m guessing) the impact of his skull. He’s all the way down, and against the fence. This is bad. Horses need room to get up. I’m terrified he might have broken a leg. I ran to him as if I could scoop up 1200 lbs and carry it gently to a stall. (Actually, it might have been possible in that moment.) With great effort, he manages to untangle his front legs and get up. He looks bewildered and is trembling slightly. I can see this thought in his brain, though it means something different to him: this is all wrong. I have so much compassion for believing you are still a Superhero. I do a complete body scan, check his pupils, poll, and knees. He takes a couple of tentative, careful steps. Not lame. Fully weight-bearing on all four. It takes awhile for his adrenaline to recede. I ask him to walk it out, so the acid doesn’t settle in his muscle. Bute and Ice are our friends. I work on his sore neck over the next week. Better? But not okay. bizarrely, he is not lame. Sore as heck, but not limping. He needs the chiropractor. I set up an appointment for the next week. I want the acute phase over before he gets any body manipulation. One mild soap/glycerin bath later, he looks like he’s getting over the measles. The hives go down. Contact allergy? Can’t hurt to do the cowboy baking-soda purge to clean out toxins. Check. Pick up baking soda. The next day, he still has hives, but he’s better. I slather Caladryl on the big ones. Check between his front legs to see if I missed any. I find loose, droopy, saggy skin on the inside of one leg. Mysterious lump near his breast. PIGEON FEVER? Are you kidding me?!?!? I scare the crap out of everyone at the barn. I tell the barn manager we might have a case of Pigeon Fever. We discuss protocol. She knows I’m onboard with strict measures. Honestly, I’m completely panicked. A 26-year-old mildly immunocompromised horse has a bad crash, develops weird mass hives, and then gets Pigeon Fever? Is this the big IT? Are we there? Any one of these things alone would not rattle me (much) but all in a row, I’m beginning to wonder if something bigger is compromising his immune system. Something more than an on-again, off-again low-grade sinus infection. Yep. Right to: HE’S GOING TO DIE. Carlos found me panicking. He very gently introduced me to this totally novel idea: deal with what is actually presenting: an unidentified lump, some edema. I stop being (mostly) an idiot. We’ll stick to the default: all horses will be safe as long as we treat it as if it’s Pidgeon Fever. Day four: just a lump covered in ichthamal. Not bigger. Not softer. Not open. Not hot. No fever. Bella remembers Hudson caught himself there once ten years ago, and developed a shoe boil. I’ve been around horses since I was twelve. Maybe I saw a shoe boil 30 years ago. Not on my radar. I begin shoe boil protocol. Order a donut. Turns out, it IS a shoe boil. In a weird spot. Hudson is convinced the donut is an ankle monitor, and he’s under house arrest. He looks surreptitiously for the orange jumpsuit. When holding the donut-encased ankle in the air doesn’t cause Jane to instantly repent and cut him free, he sighs. Walks off normally, and points his head into a far corner, his big rump angled accurately in my direction. I guess donuts are the horse equivalent of The Cone of Shame for dogs. The barn manager has a moment of panic: the old horse next to Hudson wakes up with a shoe boil AND a capped elbow, already getting infected. What are the chances…? She looks at me, then shakes her head. We both know shoe boils are not contagious. I don’t know…about an hour? These three horses have paddocks all in a line. It has to be a coincidence, but how bizarre. It’s a coincidence like this: I bang my elbow hard enough to leave a lump, and the next day, so does my neighbor, and the neighbor after that. Hudson nixed this idea. He’s positive bubble wrap is a distant cousin of the shotgun. His rump is still angled pointedly in my direction. 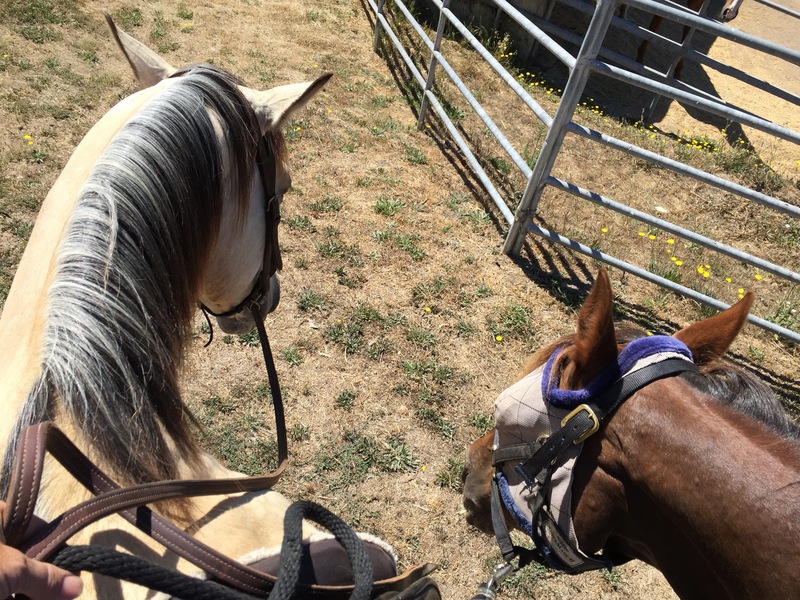 This entry was posted in As The Hot Walker Turns, Barn Culture, Sadly True and tagged Colic, Forces of Evil, Hives, Hudson, Plagues, Tempests on July 19, 2015 by Jane Clancy.